First they nursed him. Then they encouraged him. Then they told him to pull himself together... Finally, Badger could stand it no longer. That admirable animal, though long on exhortation, was short on patience. 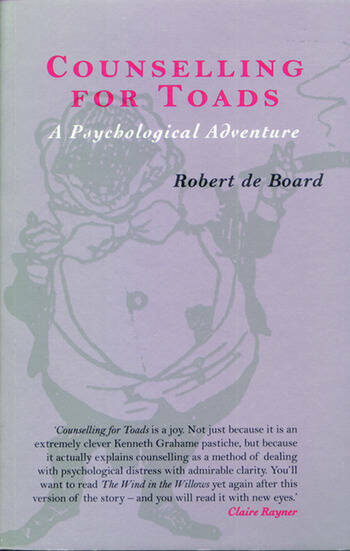 Robert de Board's engaging account of Toad's experience of counselling will capture the imagination of the growing readership of people who are interested in counselling and the counselling process. Written as a real continuation of life on the River Bank, Toad and his friends come to life all over again. Heron, the counsellor, uses the language and ideas of transactional analysis as his counselling method. Through the dialogues which make up the ten sessions, or chapters of the book, Toad learns how to analyse his own feelings and develop his emotional intelligence. He meets his 'rebellious child' and his 'adult' along the way, and by the end of the book, as debonair as ever he was, is setting out on a completely new adventure. As readers learn about Toad, so they can learn about themselves and be encouraged to take the path of psychological growth and development. Appropriate for anyone approaching counselling for the first time, whether as a student or as a client, or for the professional counsellor looking for something to recommend to the hesitant, Counselling for Toads will appeal to both children and adults of all ages. Mole Finds Toad in a Poorly State. With Friends Like These... Toad's First Meeting with his Counsellor. Why Toad Feels so Depressed. The Next Meeting. Toad Explores his Childhood. Toad Meets the Rebellious Child. A Surprise Visit from Mr Badger. After Badger's Visit. Lunch at Rat's House. Toad Meets the Adult. The True History of Theophilus Toad. The Continuous Creation of Toad's Familiar World. Playing Games or Winner Loses All. The Final Session. Farewells and New Beginnings.